Tissue engineering strategies have been pushing forward several fields in the range of biomedical research. The musculoskeletal field is not an exception. In fact, tissue engineering has been a great asset in the development of new treatments for osteochondral lesions. 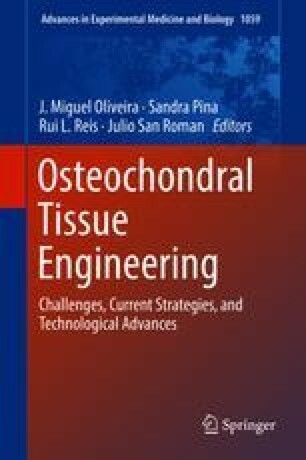 Herein, we overview the recent developments in osteochondral tissue engineering. Currently, the treatments applied in a clinical scenario have shown some drawbacks given the difficulty in regenerating a fully functional hyaline cartilage. Among the different strategies designed for osteochondral regeneration, it is possible to identify cell-free strategies, scaffold-free strategies, and advanced strategies, where different materials are combined with cells. Cell-free strategies consist in the development of scaffolds in the attempt to better fulfill the requirements of the cartilage regeneration process. For that, different structures have been designed, from monolayers to multilayered structures, with the intent to mimic the osteochondral architecture. In the case of scaffold-free strategies, they took advantage on the extracellular matrix produced by cells. The last strategy relies in the development of new biomaterials capable of mimicking the extracellular matrix. This way, the cell growth, proliferation, and differentiation at the lesion site are expedited, exploiting the self-regenerative potential of cells and its interaction with biomolecules. Overall, despite the difficulties associated with each approach, tissue engineering has been proven a valuable tool in the regeneration of osteochondral lesions and together with the latest advances in the field, promises to revolutionize personalized therapies. F. Raquel Maia and Mariana R. Carvalho contributed equally to this work. The authors thank the funds obtained through the Nanotech4als (ENMed/0008/2015), HierarchiTech (M-ERA-NET/0001/2014), and FROnTHERA (NORTE-01-0145-FEDER-0000232) projects. FRM acknowledges the Portuguese Foundation for Science and Technology (FCT) for her postdoc grant (SFRH/BPD/117492/2016); MRC acknowledges the Doctoral Program financed by Programa Operacional Regional do Norte, Fundo Social Europeu, Norte 2020 for her PhD grant (NORTE-08-5369-FSE-000044 TERM&SC); and JMO thanks FCT for the distinction attributed under the Investigator FCT program (IF/01285/2015).